The prefect was so angry that he had a great gridiron prepared, with coals beneath it, and had Lawrence’s body placed on it,(hence St. Lawrence’s association with the gridiron). After the martyr had suffered the pain for a long time, the legend concludes, he made his famous cheerful remark, “It is well done. Turn me over!” From this derives his patronage of cooks and chefs. Lawrence is believed to have been born in Spain, at Huesca, a town in Aragon near the foot of the Pyrenees. As a youth he was sent to Zaragoza to complete his humanistic and theological studies. It was here that he first encountered the future Pope Sixtus II, who was of Greek origin. The future Pope was one of the most famous and esteemed teachers in what was then one of the most renowned centres of learning. Eventually, both left Spain for Rome. When Sixtus was elevated to patriarch in 257, he ordained Lawrence deacon, and though Lawrence was still young, appointed him first among the seven deacons who served in the patriarchal church; therefore he is called archdeacon of Rome. This was a position of great trust, which included the care of the treasury and riches of the church, and the distribution of alms among the poor. St Cyprian, Bishop of Carthage, notes that Roman authorities had established a norm according to which all Christians who had been denounced must be executed and their goods confiscated by the Imperial treasury. At the beginning of the month of August, 258, the emperor Valerian issued an edict commanding that all bishops, priests, and deacons should immediately be put to death. Sixtus was captured on August 6, 258, at the cemetery of St. Callixtus while celebrating the liturgy and executed forthwith. After the death of Sixtus, the prefect of Rome demanded that Lawrence turn over the riches of the Church. Ambrose is the earliest source for the tale that Lawrence asked for three days to gather together the wealth. Lawrence worked swiftly to distribute as much Church property to the poor as possible, so as to prevent its being seized by the prefect. On the third day, at the head of a small delegation, he presented himself to the prefect, and when ordered to give up the treasures of the Church, he presented the poor, the crippled, the blind and the suffering, and said that these were the true treasures of the Church. One account records him declaring to the prefect, “The Church is truly rich, far richer than your emperor.” This act of defiance led directly to his martyrdom. Gobnait is Irish for Abigail which means “Brings Joy”. As the patron saint of beekeepers, her name also has been anglicized as Deborah, meaning “Honey Bee.” This Irish saint is a version of the deity Domna, patroness of sacred stones and cairns. The center of her worship was at Ballybourney, Co. Cork, Ireland. Her feast day, February 11 is called “Pattern Day” in the parishes of Dún Chaoin and in Baile Bhúirne, and is regarded as both holiday and holy day. In one tradition, a medieval wooden carving of Gobnait, about two feet high, kept in a church drawer during the year, is brought out. Parishioners bring a ribbon to ”measure” the statue. This ribbon is then taken home to use when special blessings are needed. Gobnait was born in County Clare in the 5th or 6th Century, and is said to have been the sister of Saint Abban. Tradition holds that Gobnait fled Clare in order to escape family feuding, settling on Inis Oírr (where there is an early medieval oratory, Cill Ghobnait, dedicated to her). Gobnait was said to have been the only woman allowed on the island, but she didn’t linger. After a time, an angel appeared and told her that she was meant to spend the rest of her days (until her soul left her earthly body) elsewhere. She would know the right place because she would find nine white deer grazing there. So she left the island to journey through the southern coastal counties in search of the deer. As a result of her quest, a number of places now bear her name – for instance, Kilgobnet or Cill Ghobnait in County Kerry and St Debora’s Well in County Limerick. She eventually came upon that mystical herd in Ballyvourney, County Cork, where she dedicated the remainder of her earthly life to pastoral work. 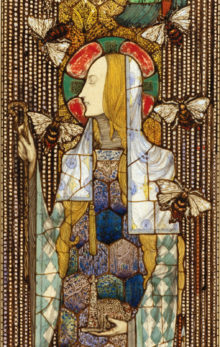 Her connection to honey bees is complex, beginning with the angel telling her to find her “resurrection place” (meaning where the soul leaves the body). Celtic lore held bees in high esteem believing the soul left the body as a bee or a butterfly. Bees were more than just honey-makers to the ancient Irish. They have long held an important place in Irish culture. The honey, wax, pollen and other benefits of bees were considered so important that in the 7th century, someone scribed the ancient laws called the Bechbretha, which translates to ‘bee-judgements.’ These laws included six different terms in Gaeilge for the kinds of bee swarms, the proper ways to decide ownership of a swarm of bees, how to punish the theft of hives or honey, as well has how much honey a beekeeper should offer their neighbors, and the Caithchi Bech, the trespassing of bees. 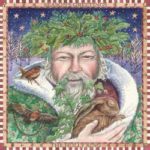 Honey is also well-known for its curative properties, and Gobnait was renowned for her care of the sick. Gobnait added beekeeping to her life’s work developing a lifelong affinity with them. She started a religious order and dedicated her days to helping the sick, probably using honey as a healing aid in the treatment of illness and healing of wounds.. St Gobnait had a particular skill in caring for the sick and she is credited with saving the people at Ballyvourney from the plague. While her focus was on pastoral work such as tending her hives, healing the sick, and founding a religious community for women, Saint Gobnait was not just a placid nun, oh no. Excavations of her home have found that she was also a metal worker, smithing and smelting. In the ruins of her church there is a smooth round iron ball set into the wall, known as St. Gobnait’s Bowl. It is said to have been used to destroy a fort built by a pagan chief on the hills north of Ballyvourney and was said to have returned to the Saint each time she threw it. Those who have grasped the bowl in the wall will know the miraculous nature of this feat. There are also legends of her setting swarms of bees on forces attempting to invade Balleyvourney, causing the swollen and stung invaders to return the cattle they stole before they fled. Some accounts go even further, with the bees miraculously changing into soldiers and their hives transformed into bronze helmets. ‘Tháinig na saighdúirí Gallda agus tógadar mórán stuic i mBaile Mhuirne, ach ar an slige dhóibh ag imeacht an bóthar soir do scaoil Naomh Gobnait na beacha as an mbeachaire. Tosnuigeadar ar na saighdúirí a chealg chun nar fágadar súil ná srón ionnta agus b’éigin dóibh an stuic fhágaint ’na ndiadh’. The English soldiers came and took a lot of stock in Ballyvourney, but on their way out the east road, Saint Gobnait released the bees from the bee-hive. They started to sting the soldiers until they were left without an eye or a nose and they were forced to leave the stuff behind them. Collected from various sources and compiled by Shirley Twofeathers for The Powers That Be, you may repost and share without karmic repercussions, but only if you give me credit and a link back to this website. Blessed be. In the Catholic tradition, Saint Anne intervenes against poverty and for cabinetmakers; carpenters; childless couples; equestrians; grandmothers; grandparents; homemakers; housewives; miners; mothers; pregnancy; pregnant women; and women in labor. Of St. Anne we have no certain knowledge. She is not mentioned in the New Testament, and we must depend on apocryphal literature, chiefly the Protoevangelium of James, which dates back only to the second century. In this document we are told that Anne, wife of Joachim, was advanced in years and that her prayers for a child had not been answered. Once as she prayed beneath a laurel tree near her home in Galilee, an angel appeared and said to her, “Anne, the Lord hath heard thy prayer and thou shalt conceive and bring forth, and thy seed shall be spoken of in all the world.” Anne replied, “As the Lord my God liveth, if I beget either male or female, I will bring it as a gift to the Lord my God; and it shall minister to Him in holy things all the days of its life ” And thus Anne became the mother of the Blessed Virgin Mary. 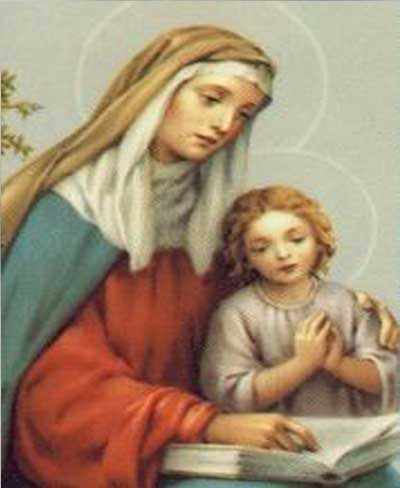 The devotion of St. Anne was known in the East in the fifth century, but it was not diffused in the West until the thirteenth. A shrine at Douai, in northern France, was one of the early centers of the devotion. In 1382 her feast was extended to the whole Western Church, and she became very popular, especially in France. Her two most famous shrines are at St. Anne d’Auray in Brittany and at St. Anne-de Beaupre in the province of Quebec. Saint Anne is often shown in paintings with Jesus and Mary as St. Anne is the mother of Mary, and the grandmother of Jesus. Two great shrines – that of Ste. Anne d’Auray in Brittany, France, and that of Ste. Anne de Beaupre near Quebec in Canada – are dedicated to her. The church of St. Ann in Jerusalem is believed to be built on the site of the home of Saints Joachim and Anne. There are even foods related to St. Anne and Joachim. Saint Anne’s symbols are her careful instruction of Mary; crown; nest of young birds; door; Golden Gate of Jerusalem; infant Virgin in crib. Her shield has a silver border masoned in black, with silver lily on a blue field referring to the girlhood of the Virgin. She is often pictured as the Woman holding Mary or Jesus in her arms or lap; Woman at her betrothal to Joachim; Mother teaching Mary to read the Bible; Woman greeting Saint Joachim at Golden Gate; Woman with a book in her hand.